“Northwest” refers to a diverse group of antique Persian rugs in myriad weaving villages and encampments that during the 19th century occupied an expansive wilderness area west of Tehran, north of Bijar, and south of Tabriz. These villages borrowed patterns and weaving styles from a scope of different areas and influences, combing them into something unmistakably unique. Many smaller rug weaving villages, too numerous to name, also contribute to the broad treasure trove of carpets from this area. All of these largely unknown villages and encampments share certain commonalities in the design, construction, and dying of their weavings. They were typically woven on a cotton warp and weft in contrast to the primarily wool foundation used by the Caucasian tribespeople across the Areas River to the North. 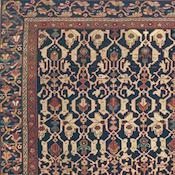 The weavers of antique Northwest rugs also share a common history which has seen both large and small changes. Over the course of a millennium they witnessed invasions and immigration from neighboring Turkic and Kurdish tribal people, and migrants moving south from the Caucasus after the Russian invasion flooded the area in the 1800s. Shahsavan tribal members from over 40 different clans were also encouraged to settle down here with their flocks of sheep. The area was originally the country of Azerbaijan and was annexed by its southern neighbor, Persia, in 1500. A mixture of incoming tribes and customs over the next several hundred years resulted in once disparate groups overlapping and absorbing one another’s practices. 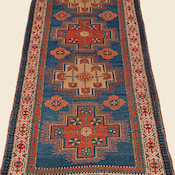 The tribal weavers of Northwest rugs then populating the area were greatly influenced by the rugs from the Caucasus mountains, with their striking geometric designs, and plethora of ancient symbolic motifs found throughout their 85 distinctive sub-groups. 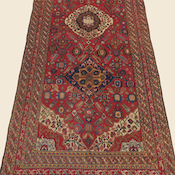 These tribal designs intermingled with the more curvilinear floral patterns from the Persian workshops of Tabriz, for example, and a new distinctive village carpet was born; one with highly geometricized renditions of traditional floral patterns. 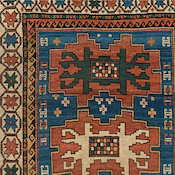 Northwest rug making was also influenced by the weaving of neighboring Turkish territories who brought their own distinct influences as well, particularly in their use of color. Collectively, the tribal weavers of Northwest Persia were great adapters, often using patterns and motifs from numerous surrounding areas which they skillfully combined into one rug. One belief about these rugs’ origin was that in the second half of the 19th century enterprising Tabriz merchants, wanting a large pool of rugs and styles to draw from, showed local weavers the fine city rugs and encouraged them to incorporate these into their rugs. 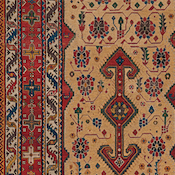 The weavers, skilled in the more spontaneous and angular weaving of tribal origin, adapted these classical carpet design with their detailed, curvilinear designs and reimagined them as more elemental and pastoral. 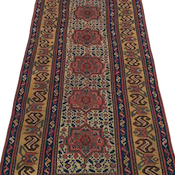 Whatever the exact influences may have been, Northwest Persian tribal rugs are marvelously effective hybrids of rustic and charming village carpets with traditional tribal motifs and geometricized dilutions of traditional Persian city patterns. 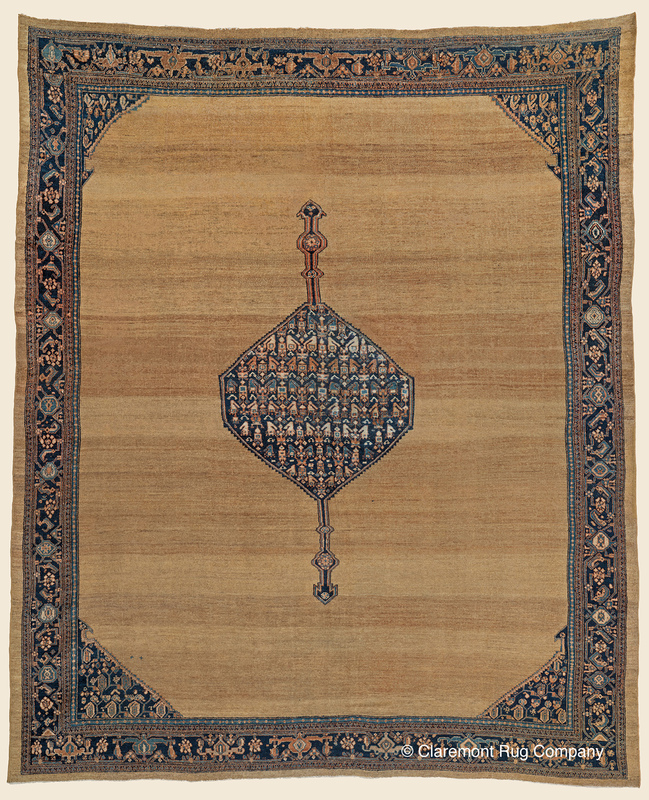 Due to their nomadic lifestyle, necessity also dictated a more modest size for their weavings. 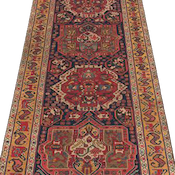 Usually stemming from 3×4 to 5×9, area sized rugs comprised the majority of their output, with uncommon “long rugs” up to 7×16 occasionally seen. The smaller weaving villages and hamlets that dot the rugged northern landscape, also contribute to this incredible legacy with their own weavings, although without the identifiable provenance of their more famous neighbors. 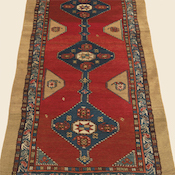 When a rug is labeled ‘Northwest,’ it is simply signifying it was woven in the larger general region without a specific village attribution.  Perhaps for this reason more than any other, Northwest rugs have received comparatively little attention from the larger rug community, despite their deeply creative and diverse level of artistry. Instead, it has more to do with the difficulty attributing them to a specific “label.” However, this does not diminish quality or stature of this often deeply compelling rugs, rather it simply means rug scholarship cannot always include knowledge of every small rug weaving village.